Heitz, Robert Fernand (1932- ) French ophthalmologist and historian. Heitz was born in Haguenau, Alsace, France. He went to Strasbourg and received his MD in 1960. His internship was spent at the Hôpitaux de la Région Sanitaire de Strasbourg from 1956 to 1960 and he became an ophthalmologist under Jean Nordmann in 1963. Heitz was assistant at the Institut de Parasitologie of the Strasbourg University from 1961 to 1962, Director of Clinical Education at the Strasbourg Louis Pasteur University from 1983 to 1997. He was Head of the Ophthalmic Clinic at the Centre Hospitalier de Haguenau and expert consultant to the Head of the Hospitals at the Minister of Public Health in Paris and to the French Agency of Health Products (as President of the Commission for Homologation and Material Control in Ophthalmology). He is a member of the Société Française d'Ophtalmologie; Deutsche Ophthalmologische Gesellschaft, Société d'Ophtalmologie de l'Est de la France, Société Française des Ophtalmologistes adaptateurs de Prothèses de Contact, European Contact Lens Society (ECLSO),( Founder, then treasurer). He is also a member of the Société d'histoire de la médecine, Société francophone d'histoire de l'ophtalmologie and the Julius Hirschberg Gesellschaft fuer Geschichte der Augenheilkunde. 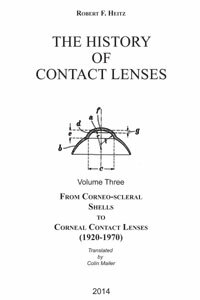 Heitz attained his PhD (Paris, École Pratique des Hautes Études) after presenting a thesis on the History of Corneal Neutralization and of Contact Lenses (Étude historique des principes et des applications des systèmes de contact oculaire dans le contexte des connaissances du XVIe siècle à la première moitié du XXe siècle). This thesis will be published in an English version (translated by Colin Mailer) by Wayenborgh Ostend/Belgium, as part of the Hirschberg Series. For his activities to the Public Health, Robert Heitz received the French Ordre National du Mérite.